W3: Design Thinking for Educational Resources: Reimagining Instructional Design through Engaging Participatory Approaches. 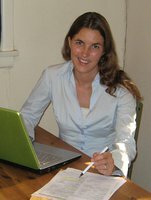 Stefanie Panke is an Instructional Analyst at the University of North Carolina at Chapel Hill. In her current position she conducts instructional design projects that center around assessment and emerging technologies, particularly online publishing and e-books. Her interests comprise application-oriented research projects on online learning, web 2.0 and open educational resources. Prior to her current position she worked as Director of E-Learning at Ulm University, Germany. Stefanie holds a PhD in Applied Linguistics from the University of Bielefeld. In 2009, she completed her thesis on the information design of educational websites. During her PhD, Stefanie was a researcher at the Knowledge Media Research Center in Tübingen, Germany. She serves as a member of several program committees (ED-MEDIA, E-LEARN, SITE, ECEL), as a reviewer for MERLOT Journal of Online Learning and Teaching and Digital Humanities Quaterly and as editor for social software at the Educational Technology and Change Journal.